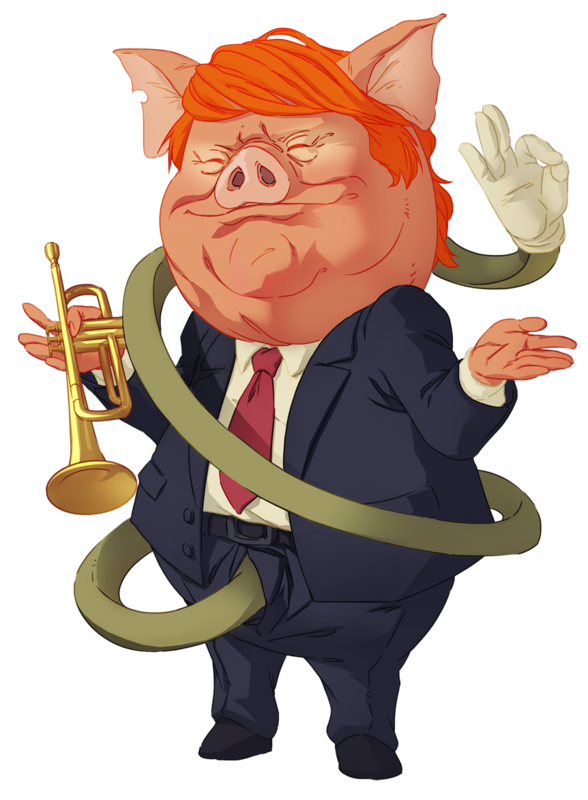 is the completely true account of the life of Trumpigula, a pigman inspired by Donald Trump and Caligula. Trump’s and Caligula’s similar personality traits naturally blended to become Trumpigula, the most wicked and wonderful leader, ever. Come read Trumpigula’s fascinating life-story, one that makes Trump’s and Caligula’s seem quite ordinary. See why critics have nominated Trumpigula for Greatest Leader Ever. Help satisfy his ego by agreeing. You’ll thank yourself for taking the time to open your mind to Trumpigula and his story. Trumpigula wants his story to become an animated movie based on his screenplay, so is raising funds to pay for the movie production. All proceeds from the sale of the songs and slop, and money raised through crowd-sourcing campaigns, will be used for that purpose. If you have skills or ideas to help with his cause, please let Trumpigula know at emperor@trumpigula.com. He really would like to find the Producer to bring it all together. A word of caution: Trumpigula is intended for mature audiences as Trumpigula’s story is related to Donald Trump. Obviously, that means Trumpigula the Story is raunchy and can cause deep-seated trauma you can only wash off with repeated scrubbing. It’s taboo in most states, and defiantly banned in Russia. While Trumpigula the Story attempts to provide comic relief to a serious topic, and maybe gives hope that Donald Trump can be redeemed, reader discretion is highly advised. You may be dirty after reading. 1/1/19-Year three of President T and we’re barely scraping by as he keeps trumping us. Trumpigula keeps evolving. His story has been updated. Trumpigula has his screenplay here. For those feeling disheartened by what Trump is doing and will continue to do, please consider supporting Trumpigula’s goal: help redeem Donald Trump. Thanks to those who are not going to let Trump just trash this country and planet with his greedy, selfish, childish and predatory ways. Please consider donating to help Trumpigula reach his goal. If you like the story and would like to donate to keep Trumpigula alive, please donate. Every bit helps the fund-raising goal. All songs featured in the story can be found on the songs page. Please consider purchasing the songs for download. Every bit helps the fund-raising goal. All of Trumpigula’s slop he’s selling can be found here on the slop page. Please consider purchasing merchandise. Every bit helps the fund-raising goal. If you are a ranter and/or raver, visit the Forum to show Trumpigula how you’re really feeling. Go ahead and try to hurt his feelings, try to make him laugh, or share your thoughts and art. He loves your feedback, no matter how nasty it is.